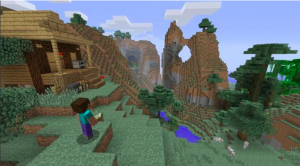 “Kids are learning about money on a lot of different levels in Minecraft,” says Joel Levin, co-founder of Manhattan-based TeacherGaming, a firm that works with educators to use video games as teaching tools. Levin is aware of instances where teachers introduce a rare item into the game that kids can't obtain on their own, and then watch them react to the scarcity. “It's supply and demand in action,” he says. Indeed, Minecraft is a so-called “sandbox” game, in which players roam a virtual world with very few limitations. In that way, it is a riff on the traditional American archetype of the Horatio Alger story – starting from nothing and somehow making a huge success of yourself. As in life, very bad things happen all the time in Minecraft – death, robbery, physical attacks and disasters of all stripes. As a result, players have to protect themselves against a number of terrible futures. But it is not just death players have to insure themselves against. That is because some people in this virtual world – known as “griefers,” according to Patrick – go online solely to steal and break other people's things. “If I was starting from scratch and didn't know any coding, I could be digging for emeralds forever,” says Dan Short, associate professor of environmental science at Robert Morris University in Pittsburgh, who has written an academic paper on Minecraft. Once you become talented at something, you could find yourself in serious demand. Fifteen-year-old Sean Mulvihill plays with his buddies Jackson, Oscar and Wyatt. “Jackson is known for being the best builder, and others pay him to build them a house,” Sean says. Meanwhile, Sean is seen as “by far, the best farmer,” he notes modestly. As a result, other players come to him with business propositions, like supplying him with seed, equipment and gold in order to tend their farms and divvy up the profits. This principle of monetizing your Minecraft skills applies in the real world, too, notes Short. Some have become so talented at the game and charismatic with their audiences – with handles like TheBajanCanadian, Sky Does Minecraft and Lewis & Simon – that they run their own insanely popular channels on Google Inc's YouTube. via What Minecraft is teaching your kids about money | Reuters.